Taking an 18 pct stake in AirAsia’s new budget carrier may be small for Japan’s $18 bln e-commerce giant. But the justification – boosting its travel website – is a stretch at best. Rakuten’s patchy investment track record is another reason to be sceptical about the new venture. 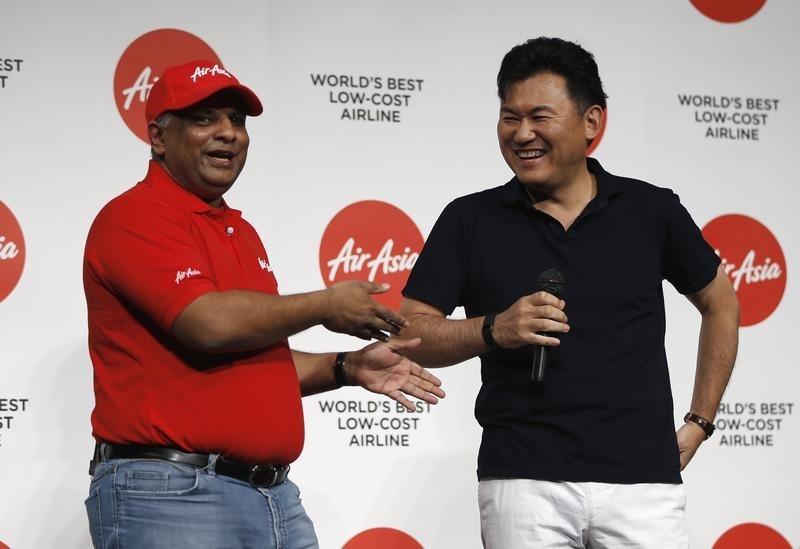 Chairman and CEO of e-commerce operator Rakuten Inc Hiroshi Mikitani (R) and AirAsia Group CEO Tony Fernandes exchange smiles during an AirAsia Group news conference in Tokyo July 1, 2014. Japanese e-commerce group Rakuten announced on July 1 that it had taken an 18 percent stake in AirAsia Japan for an undisclosed price. AirAsia Japan is a new low-cost carrier to be operated by Malaysia-based AirAsia with an initial capitalisation of 7 billion yen ($69 million). AirAsia will own a 49 percent stake in the new budget airline, which it expects to launch in June 2015. Other minority investors in the airline include Noevir Holdings, a cosmetics-to-health food conglomerate with an aircraft leasing business, sports goods company Alpen and Octave Japan Infrastructure Fund. The venture is AirAsia’s second attempt to launch a low-cost carrier in Japan. In 2011, AirAsia partnered with Japanese airline ANA but the joint venture dissolved in 2013. Rakuten owns Rakuten Travel, an online travel agency. According to the company, Rakuten Travel has over 29,000 member hotels on its site and has 20 offices across 12 overseas markets. Since 2009, Rakuten has made 62 acquisitions and investments with a disclosed value of $3.4 billion, according to Thomson One. Its most recent acquisition was the $900 million purchase of voice messaging service provider Viber on February 14. Shares of Rakuten traded at 1368 yen on the morning of July 2, up 1.63 percent.